Mumbai: An association of Tata Trusts and People for Animals are all ready to leg-up innocent animals in pain. A multi-specialty Veterinary hospital is expected to stand stoutly in Navi Mumbai to clasp needy animals within 2 years. The proposed magnificent hospital spread over 9,000 sq mts, inclusive with an emergency clinic, which will serve the needs of all domestic and farm animals at accessible and affordable rates. The foundation stone of Animal Care Hospital, was laid under the gracious presence of dignitaries like -Chairman of Tata Trusts: Mr. Ratan Tata; Chief Minister of State: Devendra Fadnavis ; Ministry of Women and Child Development: Maneka Gandhi; Minister of Finance, Planning, and Forest Departments in the Government of Maharashtra: Sudhir Mungantiwar and Minister of Animal Husbandry, Dairy Development and Fisheries Development in the Government of Maharashtra: Mahadev Jankar; on 24 march 2017. The ceremony, whose commencement was marked with the speed painting, made by renowned artist Vinod More was signed by all the dignitaries and will be placed in a hospital as an emblem of love and the unspoken bond between man and animal. The hospital intends to embody- emergency, in-patient and out-patient facilities for small and large animals. The Centre will be equipped with operation theatres, an intensive care unit, recovery rooms, imaging and pathology services, etc. It is conceived as a one-stop destination that provides high-quality medical care for animals, with specialised services in orthopaedics, dentistry, trauma surgery and other treatments, which is the need of the hour in the greater Mumbai region. 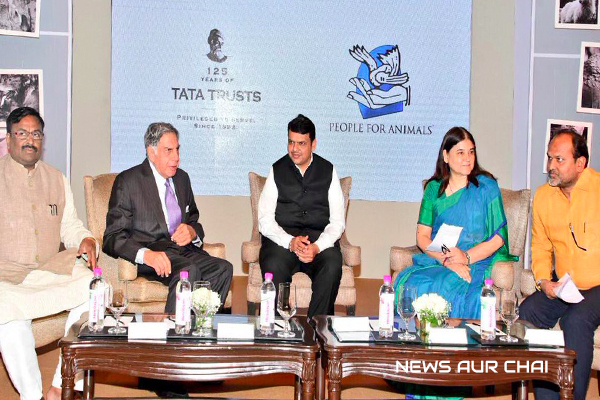 At the event, Devendra Fadnavis talked about the transitional journey of a man from being compassionate about animals to animal lovers to finally animal activists. 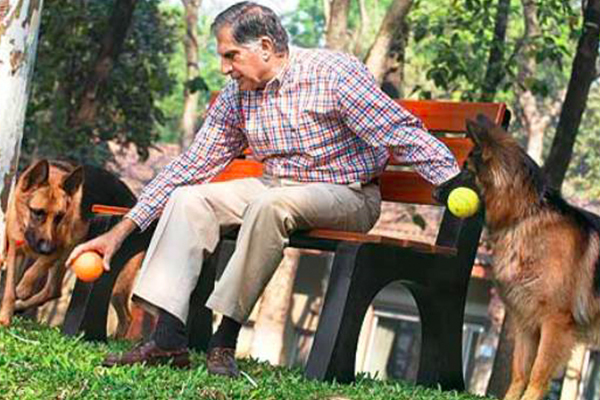 Ratan Tata’s love for animals is very significant from the affection that he holds for the two of his dogs. 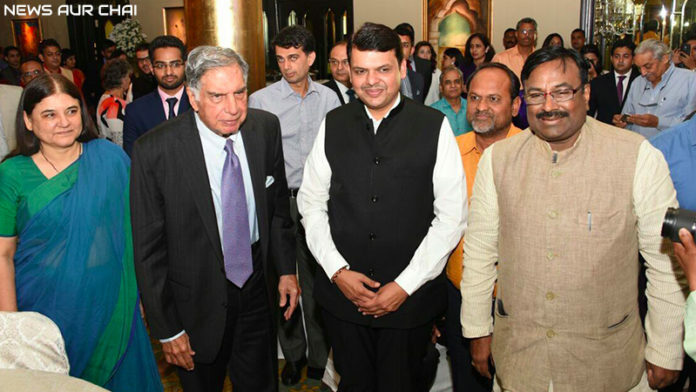 The inauguration function was remarked by Mr Tata as a “special day”. “Today is a very special day for me because it is a dream for me and I can see it coming true. A state-of-the-art animal and care unit for the city of Mumbai was much needed. We are happy…. Tata Trusts has agreed to fund this facility as it will help save animals, beings who give so much of themselves to us. A promise has been made to give the city a good facility and I trust all of us who have been involved, to have the passion and integrity to make this happen.” the Chairman said at the announcement here. 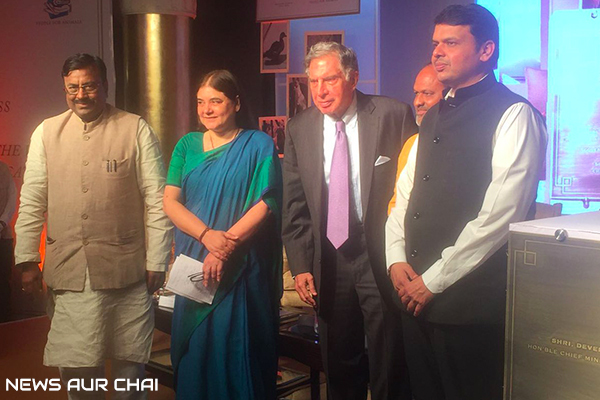 Maneka Gandhi was seen as remembering those good old days and nostalgic memories with Mr Tata. The million dollar smile on her face spoke a lot about her passion for animals, her journey as an animal rights activist and the immense pleasure that she felt as being part of this endeavour. 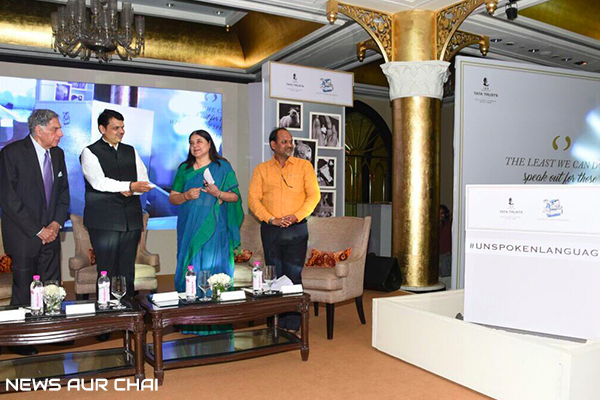 “I would like to thank Shri Devendra Fadnavis and Mr Ratan Tata for their support to realise a vision that dates back to 35 years when Pritish Nandy, MF Hussain, Mario Miranda, Anupam Kher and I came together and voiced our need for a pan-India animal organisation. I approached Tata Trusts and they have always helped me for various programmes and I am deeply grateful for this. Today, what is taking place is a miracle. I am deeply grateful that the Chief Minister agreed to come and be with us today. He runs a pragmatic, compassionate and good government. I extend my best wishes to make this hospital an amazing one in the years to come.” Maneka Gandhi said. In addition to the medical facilities for animals, the proposed hospital will also impart continuing veterinary education, training and host workshops and programmes for the skill development of practising veterinarians. It is expected to become a top-quality institution for the animal as international partners such as Cornell University’s College of Veterinary Medicine, who are the world leaders in veterinary care, is in association with this venture. Cornell University will bring to the project their expertise and provide inputs on the designing, planning and operations of the facility. Deepa Karmakar all set for the vault of her life!